Forty two women in Second Life put their best foot forward to become the next Ms. Sweethearts. This weekend four out of the five ladies chosen through the public vote all stepped forward to compete in the Ms. Sweethearts Pageant. Shannon Bramlington the owner and coordinator told me each applicant had to be over thirty days old, unaffiliated with any other club in SL, and a Sweethearts group member. They had to write a small biography to give the public a glimpse of their personality and to learn about them. This Saturday was the final crowning: Mrs. Grasshopper, Rose Athena, Bella, Kennedy Fairlane, and AuroraLightwood were all chosen by the public as the Final Five. AuroraLightwood regretfully couldn't make it, so retained her fifth place she earned through public vote. It was the first pageant I had ever attended on SL and each girl was excited to tell me a bit of what they were feeling. I walked into Sweethearts' beautiful ballroom to see a stage set up to one side of the floor. An invisible prim kept others from walking over it while the girls were each asked to walk up and down the runway and answer three rounds of questions. The judges were all kept secret until right before the ceremony. Ms. Omalley Farspire, introduced as just Omalley was the current reigning Ms. Sweetheart. Ms. Torid Silverweb who is the owner and creator of Tori's Stylez and Mr. Rockwood Waco the owner of Lovit Avatars. Blake Hambleton, also Sweethearts owner, mc'd the entire event as Shannon wrote everything said in nearby so everyone was sure to see or hear what was going on and keep up with the contest. There were three rounds of questions, the first two were preapproved questions, and the last was a wild card question. They had two minutes to answer and the judges were left to score each contestant in seven categories: Maturity, Humbleness, Beauty, Gracefulness, Ability to answer the question, and Personality. These girls had courage to walk across this stage and answer with the grace each showed. It is easy to look back and think of what a person might have said, but they were put on the spot and were quick, intelligent, sweet ladies. That made this whole experience a joy to watch. Fourth place winner was Mrs. Grasshopper. She was nice enough to speak with me before the event and tell me a bit about the thoughts. Ccoursey: Are you more excited or nervous? Ccoursey: Is this your first pageant? Ccoursey: Is there anything specific on your mind as Saturday gets closer? Mrs. Grasshopper: Answering the questions in a two minute time frame. Ccoursey: How'd you get into the Ms. Sweethearts Pageant? Was it a spur of the moment thing or had you heard about it before and decided it was something you wanted? Mrs. Grasshopper: Well, my husband and I have got to Sweethearts for a very long time and I would see the ad for the contest and wanted to do it, but never built up the nerve to do it. So one night dancing with my husband, I told him and he said come on lets do it. So there I was joining the contest. Ccoursey: Any advice on making it to the final five for those of us who know nothing of Pageants? Mrs. Grasshopper: Stay calm and enjoy it- It's fun. Ccoursey. Congrats Mrs. Grasshopper and thank you for taking time to speak with me. The Ms Sweethearts Hopeful who made third place was Bellalula. She was nervous and excited before the show, sparing a moment to speak with me. Her advice was to Just be yourself and do all you can to be the best you can be. It was also her first pageant, but the professionalism showed today you couldn't tell it with Bellalula or any of these ladies. Thank you Bellalula and Congrats. Second place was a bit more involved, if for any reason the winner of Ms. Sweethearts is unable to fill her duties, the 2nd place winner will step up and fill her shoes. Kennedy Fairlane swooped in with second place. Speaking with her a few days before it was easy to feel her excitement going into the final ceremony. Ccoursey: Are you more excited or nervous going into the Final Five? Kennedy Fairlane: Honestly? I'm a wreck! Ccoursey: Is this the first pageant you have ever been in? Kennedy Fairlane: It is. I haven't really had any interest in representing any venue other than Sweethearts. Kennedy Fairlane: Specifically, I am wondering what the judges will be looking for as their questions. I'm very confident that if I just be myself and express my thoughts completely I should do well. Ccoursey: For those of us who know nothing of pageants is there any advice you can offer after your experience so far? Kennedy Fairlane: The advice I would give is to be sure you want to commit to the venue. Be sure that you really LOVE the venue and are not in it for the L's. If you win, you will have MORE fun representing the venue if you have a 'love' for the folks. I would also like to relay that dress and attention to detail in your look should be of utmost importance. A friendly attitude toward the other contestants and guests of the venue is also very important. Ccoursey:” Thank you Kennedy for your time and Congrats. This years Ms. Sweethearts is Rose Athena. Congrats Rose. She won 100,000 lindens, the crown, and the title of Ms. Sweethearts. Ccoursey: Are you more excited or nervous being in the Final Five? Rose Athena: I am a lot more excited then nervous this year due to being in Ms. Sweethearts last year. I know whats expected and fully prepared ahead of time. Ccoursey: May I ask how you got into pageants? 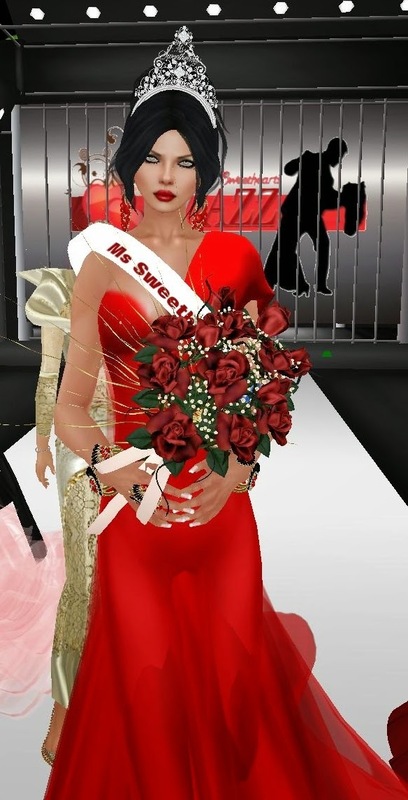 Rose Athena: I've always liked pageants in real life so coming into Second Life it was something I wanted to do. Once I found out about Ms. Sweethearts last year I had to enter. Ccoursey: Is there anything specific on your mind as Saturday nears? Rose Athena: yes and thats the questions. As any pageant contestant understands that the questions are very important. Besides that I'm ready for Saturday. Ccoursey: Is there any advice you could give after this experience? Rose Athena: The best advice I can give is watch pageant videos. A person can learn a lot from watching videos and following pageants. Ccoursey: Congrats Rose on being crowned the new Ms. Sweetheart. I spoke with several of the ladies after the show. They expressed to me they each had a fun experience and were ready to do it again next year. Rose said she wouldn't change a thing. The excitement filled Sweethearts as each question, judges deliberations, and the final announcements were delivered, making it a nail biting, edge of your seat event. Thank you Sweethearts for the opportunity and thank each participant that took time out to speak with me.